What really causes hair to fall out without warning? Given that a woman's hair can feel pretty central to her femininity, it beginning to drop out without warning can be hugely distressing for those affected. But what is alopecia, why does it cause hair to fall out unexpectedly, and who does it affect? We chatted to Dr. Jemma Batte, a doctor at Bupa UK, to find out. The first is Alopecia Areata, which Dr. Batte explains "is caused by an overactive immune system, which can start targeting your healthy cells. The immune system targets the cells in your skin where your hair grows, making it weaker and causing your hair to fall out in patches." This type of alopecia is most common in women under the age of 30, but isn't unheard of occurring at any age. 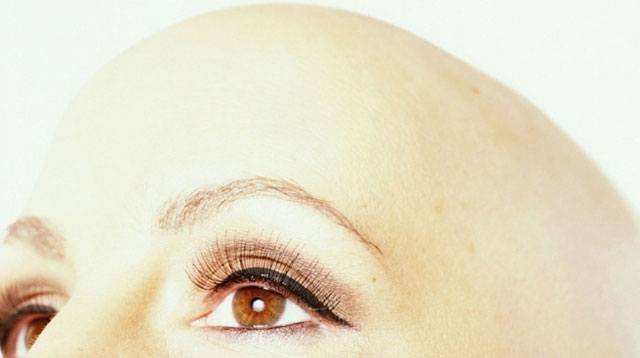 The second type of alopecia is referred to as "female pattern hair loss." "This type of alopecia usually affects women around or after the menopause, which is typically around 50 years old," says the doctor. "Around 2 percent of people are affected by Alopecia Areata in their lifetime," which is a slightly higher percentage than you might expect. The stats are a lot higher when it comes to some degree of female pattern hair loss, though, which will reportedly affect nearly half of us over the age of 70. Both types of alopecia can be passed down by family members. "If a family member lives with or has experienced hair loss before, you may be more prone to hair loss," notes Dr. Batte, pointing to the statistic that one in five people that live with alopecia will have a family member who also has or has had alopecia in the past. "Hair loss can also be brought on if you've recently experienced a traumatic event or stressful time in your life," says Dr Batte, adding: "The high levels of stress hormones in your body that are produced in response to this may cause your hair to fall out." "Stress in some people can also lead to an uncontrollable urge to pull out the hair from the scalp, eyebrows, or eyelashes, known as trichotillomania." "Your hair is made of a protein called keratin, so diets that are extremely low in protein may be associated with hair loss," says Dr. Batte. She also mentions that low iron diets can also affect hair loss, so says her "best advice is to eat a healthy and balanced diet." Although women who experience female pattern hair loss may notice that their hair thins out first on top of the head before it begins to fall out, this isn't the same as Alopecia Areata. "Those experiencing this have coin-shaped bald patches on their head," says Dr Batte. Which sounds slightly odd, given how dramatic the effects of alopecia can feel. But Dr Batte explains that because hair loss isn't life-threatening and has no harmful effects on the body, "often treatment isn't necessary." "If there aren't any signs of re-growth, you may want to talk to your doctor about a referral to a dermatologist. They can then discuss what treatment is best, as creams or steroid injections might be available to you," says Dr. Batte, adding that "there are no guarantees that these treatments will be effective, and it will take at least three months to see if it's going to work, so some women opt instead to explore a hair transplant." For those with female pattern hair loss, the doctor advises that "you can buy Minoxidil, a cream or foam that you rub on the scalp twice daily. It takes at least six months to see an effect if it's going to work, but unfortunately there is no guarantee it will," she clarifies, adding: "Stopping the treatment can cause your hair loss to worsen, so it's best to speak to your doctor before buying this treatment, to help you find out as much as you can about it beforehand." "Your mental health is just as important as your physical health," Dr. Batte reminds us, before flagging that "it's important for you and your doctor to understand how losing your hair might be affecting you psychologically. Your doctor can help you get in touch with the support that's right for you." "A common myth is that shampooing can affect your hair loss, but this is wrong," says Dr. Batter. "You can shampoo as normal, as this won't worsen hair loss." "It completely depends on the individual," says our medical expert. "A person with mild Alopecia Areata can expect to have a full head of hair again within a year. For a person with more severe Alopecia Areata or with female pattern hair loss, there is no guarantee that the treatments available will work and the hair may not grow back." "Alopecia Areata can and does recur in some people, especially if: your hair loss starts in childhood; it affects more than half of the hair on the scalp; if your eyelashes and your eyebrows are affected too; if you have eczema; or if someone in your family experiences or has had alopecia." For others, though, they can experience a single episode and it might never come back.